The Hotel Daniel is a 115-room boutique hotel in Vienna, Austria. The Hotel Daniel is in a landmark 1962 building, originally designed by Georg Lippert and Roland Rohn, that has recently been renovated by architects Christian Heiss, Michael Thomas, and Thomas Mayer. Keeping the building's original monolithic appearance intact required careful redesign to accommodate the required number of rooms. The end result is a high-design gem in the heart of Vienna, with views from almost every room. 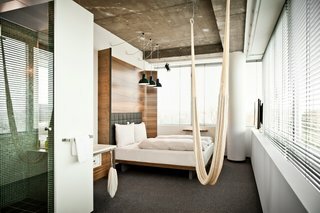 For more modern hotels and design-focused travel destinations, check out Dwell's travel coverage. There are no closets and no minibars in the guest rooms, reflecting the designers' minimalist approach. Features include a curved wooden headboard and a hammock hanging from the ceiling. Unfinished ceilings reveal partitions of the old structure, even down to the screws. The clean, simple aesthetic of the lobby includes Katakana chairs and design pieces from Donna Wilson. There is also an original Jugendstil couch, which has converted into a swing. 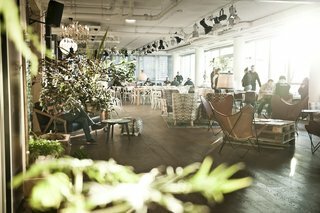 You can sit at the tasteful bar and coffee shop, taking in the beautiful view through the preserved glass facade of the building. The artist Erwin Wurm constructed a piece specifically for the hotel. 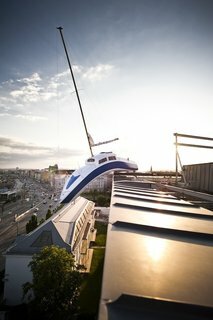 He and his team created a replica of a boat that appears to be dripping off the 7th floor of the hotel. "The Trailer" is a 1952 22-foot Silver Creek Clipper completely converted into a 112 euro-per-night room. The trailer redesign was overseen by Hansjorg Kofler and is referred to as "the island" of the hotel. 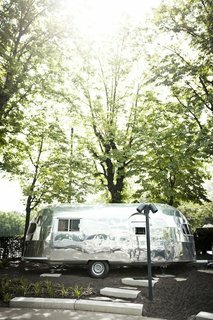 The Airstream was completely stripped and refitted with thermal insulation, soundproofing, A/C, wifi, and hot water. The front garden at the Hotel Daniel is the epitome of urban gardening. Guests can roam free and pick their own vegetables and grapes. The garden is also filled with tomatoes, cucumbers, pumpkins, and herbs. 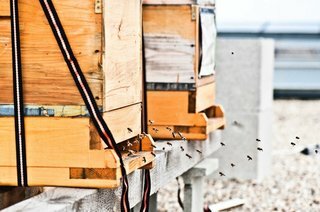 The hotel harvests bees on the roof and makes use of the honey in its bakery.